Persistence Market Research (PMR), in its recent study on the control flow choke market, offers a detailed value-volume analysis of the control flow choke market on the basis of various segments such as material type, type, shape, operation, end use, and region. In terms of material type, the carbon steel control flow choke segment is projected to be a lucrative segment in terms of growth opportunities, and these chokes are considered to be the most common types of control flow chokes. There has been significant growth in various end-use verticals due to the expanding oil & gas, chemical & petrochemical, and energy & power industries that are outperforming global trade growth. From a macroeconomic point of view, a positive outlook for end-use industries will create opportunities for control flow choke manufacturers around the world. The control flow choke market report covers market analysis through basis point analysis (BPS), absolute dollar opportunity index, market attractiveness analysis, and Y-o-Y growth. The volume analysis for the control flow choke market has been considered in units (number of control flow chokes for the current base year), covering data for the historical period 2013–2017 and forecast for 2018–2028, with 2017 as the base year. This global control flow choke market report consists of around 21 sections that elaborate on the market numbers in terms of volume in units and value in US$, at the regional and global levels. The first section of the global control flow choke market report covers an executive summary that highlights the key trends that are being witnessed in the global control flow choke market from the manufacturers’ side as well as consumers’ side. The next section covers the global control flow choke market introduction, including the taxonomy by material type, type, shape, operation, and end use; definitions of the segments considered; key success factors to the market; and other information relevant to the global control flow choke market. In the next section of the global control flow choke market report, we have included market viewpoints that include macroeconomic factors, forecast factors, and value chain analysis, along with a list of raw material suppliers, and control flow choke manufacturers, distributors, and end users. This section also covers the market dynamics, which includes several drivers responsible for the growth of the market, restraining factors, and opportunities in the market, as well as several trends with respect to global as well as regional markets. The successive section of the global control flow choke market report includes a global industry analysis by volume and value, along with pricing analysis for North America, Latin America, Europe, South Asia, East Asia, Oceania, and the Middle East & Africa, with a weighted average price for every region and product type segment. The next section of the global control flow choke market report includes a qualitative and quantitative analysis of the control flow choke market by every segment considered. The report also includes an additional section with detailed analysis of the market for three emerging countries - China, India, and Mexico. This control flow choke market report focuses on analysing the market opportunities and getting a detailed understanding of the control flow choke market. The control flow choke market report elaborates on the regional analysis, market dynamics, market intensity, market structure, and competition landscape of the control flow choke market for the next ten years, i.e. 2018-2028. Each section of the control flow choke market report includes a qualitative and quantitative assessment of the market on the basis of historical data or developments, and facts and key opinions collected from various end-use industry participants through primary interviews, annual reports, newsletters, press releases, etc. PMR’s report on the global control flow choke market studies some of the major players in the control flow choke market, such as Schlumberger Limited, General Electric, Emerson Electric Co., National Oilwell Varco, Inc., The Weir Group Plc., TechnipFMC Plc., IMI Plc., Nova Inc., Master Flo Valve Inc., Velan Inc., and Taylor Valve Technology, among others. The initial stage of the research study includes the formulation of assumptions, which are necessary for primary and secondary research. Further stages of research involved the triangulation of the data collected from these two approaches. To analyse the global market trends and opportunities for control flow choke manufacturers, the market has been segmented on the basis of material type, type, shape, operation, end use, and region. For the analysis of consumption, we have considered FY 2017 as the base year. Basic data was collected from manufacturers’ annual reports, newsletters, public reports published by governments, valve manufacturing associations & organisations, private agencies, World Bank’s sources, etc. For the final analysis of the market data, we considered demand-side as well as supply-side drivers and trends in various regional markets. We have forecasted the market data on the basis of key developments, regional trends, and the production-consumption scenario of the control flow choke market. For forecasting the market data, we have considered historic data for the period of 2013-2017. The global control flow choke market was valued at around US$ 578.8 Mn in 2017, and is estimated to grow at a 3.1% CAGR over 2018–2028. In terms of unit sales, South Asia and East Asia are expected to register relatively high value and moderate volume growth in the control flow choke market throughout the forecast period. The factor responsible for the growth of the control flow choke market is the robust growth of industries such as oil & gas, chemical processing, energy & power generation, food & beverages, and general machinery, among others. The aforementioned industries in countries such as the U.S., China, India, and other Asian countries is the key driving factor for the growth of the control flow choke market. Moreover, low production cost and labor cost in developing economies are encouraging various end users and industrial operators to expand their manufacturing facilities in these regions, which, in turn, is expected to drive the demand for control flow chokes. Growth in digitalization and the increasing need for remote applications have enhanced the demand for smart control flow chokes that help in improving durability and minimizing product loss. 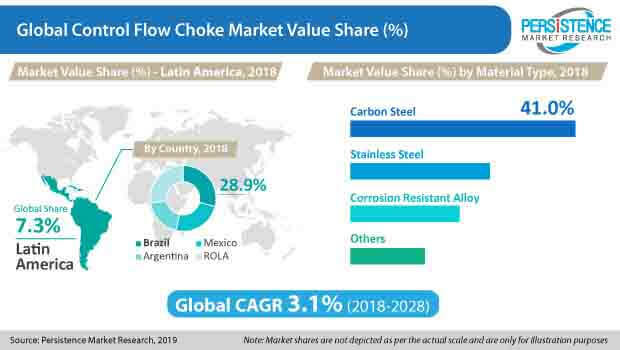 China, India, Mexico, Argentina, and the ASEAN region are picking up in the control flow choke market, owing to the robust outlook of various industries in these regions. Shale gas is majorly produced in countries such as the U.S., China, Canada, and Argentina. These nations commercially produce either shale gas or crude oil from tight oil. Currently, shale gas and tight oil production is driven by the U.S., where control flow chokes are installed. Growth in the momentum of hydraulic fracturing has driven the market for control flow chokes in oil and gas production applications from 2011-12, and the sales of control flow chokes were the highest between 2011 and 2014. From 2015-16, oil and gas operators have suspended new oil and gas drilling operations due to low crude oil prices, which hampered the sales of control flow chokes. Currently, the rise in crude oil prices is giving opportunities for new investments in drilling and production processes, and is driving the installation of new control flow chokes. For an instance, in the U.S., hydraulically-fractured horizontal wells cover nearly 69% of the wells that were drilled for oil and gas in 2016-17. This has given an opportunity for the suppliers and manufacturers of control flow chokes in oil and gas upstream operations. The aforementioned factors are expected to boost the demand for control flow chokes during the forecast period. During recent times, the slowdown in the oil & gas industry had subsequently resulted in a drop in drilling and exploration activities, owing to which, the demand for control flow chokes had also taken a hit. Apart from this, excessive production of steel and a significant drop in its demand had also severely impacted the control flow choke valve manufacturing industry. For example, drilling activities across the globe reduced by more than 30% in 2016 as compared to 2015, especially in the U.S., where more than 45% decline was registered. This has negatively impacted the sales of control flow chokes. Recently, it has been observed that, the oil & gas industry is channelizing its efforts to facilitate recovery from the aforementioned slowdown in the adoption of control flow chokes. For instance, the agreement between OPEC and some non-OPEC countries in 2017-18 to cut down production and accelerate the balance between supply and demand, alongside reducing excessive inventory levels, has reinforced oil prices, and is driving the sales of control flow chokes. The aforementioned strategy to cope up with the economic slowdown of the oil & gas industry is expected to increase the demand for control flow chokes across the globe during the forecast period. Top companies operating in the control flow choke market include are Schlumberger Limited, General Electric, Emerson Electric Co., National Oilwell Varco, Inc., The Weir Group Plc., TechnipFMC Plc., IMI Plc., Nova Inc., Master Flo Valve Inc., Velan Inc., and Taylor Valve Technology, among others. Their strategies are to invest in new corrosion-resistant materials at competitive pricing, and set up new production units in the ASEAN and African regions, which will drive the revenue growth for the global control flow choke market. The control flow choke market report is designed to provide relevant information regarding these players, and also about the key strategies that they have adopted.